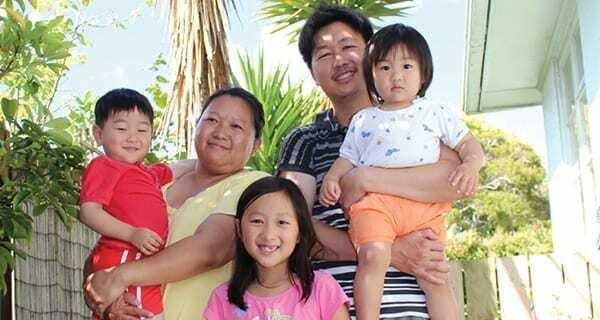 The San family fled their home country Burma and left behind all they had, becoming refugees. Now they are at the beginning of a journey towards home ownership, alongside Habitat for Humanity. Something they could only dream of in the past. The San family – Nang Phong, Zaw Mai and children Shong (7), Jack (3) and Mia (1) were chosen by Habitat to be part of the Assisted Home Ownership Programme in Hamilton. “Sometimes I think I am in a dream, but I am not, it is real.” Nang Phong smiles. On settling in New Zealand, the couple has worked hard to build up their lives. Zaw Mai found work in the aviation sector and has recently completed his level four certificate in building. Both continue to learn English and Nang Phong wants to go back to work once all children are at school. Nic Greene, General Manager of Habitat for Humanity Central North Island has a lot of confidence “the San family will thrive. They are a hardworking and responsible family. All they need is support to get over the first hurdle of home ownership. Something that Habitat’s Assisted Home Ownership Programme does.” But it does more than that. The programme helps to break the cycle of poverty. “A stable and suitable living environment where a family can stay for as long as they want. This positively impacts wellbeing, health and education and with that employment opportunities improve,” Nic Greene explains. When certain expectations are met during the rental phase, the family would then be able to purchase the home. They do this utilising the rent they had paid less Habitat’s expenses and often utilising Kiwisaver.